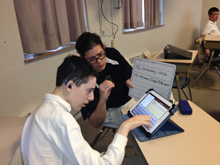 St. Rita School For The Deaf is a high school-aged class of multi-handicapped students. We serve students through their senior year of high school . Functional Academics - skills related to reading, writing, numeration, computation, problem solving and consumerism Communication - finding alternative methods of communication for students to express basic needs or thoughts, enabling them to interact with people who do not know sign language, as well as interpreting services (securing and utilizing). How do we address the educational needs of these students? Deaf and multi-handicapped learners learn best through visual and hands-on activities. Experiencing reading in the community (ex. Signs, directions, etc.) motivates them to develop reading skills for their own survival. Math skills are learned through money exchange (grocery shopping, restaurant and store purchases, etc.). Social studies and science are learned best by real-life interaction and exposure to community and historical artifacts and events - and science through interaction with the environment.